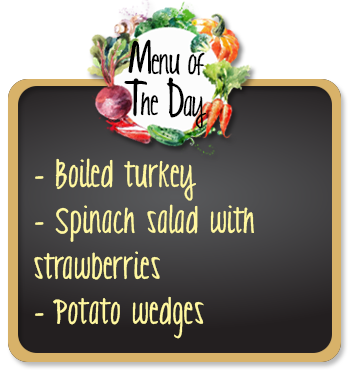 Mix the spinach leaves, strawberries, green onions, finely chopped dill and almonds in the salad bowl. Grate the goat cheese on top. Mix the dressing ingredients in a small jar and pour on the salad. Bon appetit. Contains folic acid, which is especially important for pregnant women. Spinach contains calcium just like other dark green vegetables (leek, broccoli, parsley, rocket and so forth). Spinach can either be cooked or mixed with high protein food such as yoghurt sauces or tuna fish and goat cheese and consumed as a main dish. Dietary Guidelines for Turkey. Faculty of Health Sciences, Department of Nutrition and Dietetics, Hacettepe University, 2015. Chick Peas: High in fibers, which supports the digestive system functions. Good source of zinc, which plays and important role for the immune system and healthy growth and development. Gassy side effects may be minimized by steeping or cooking well. Do not discard the cooking water. Green Peas: Fresh peas have a higher vitamin C content than dried peas. Good source of fiber. Rich in vitamin K, which helps blood coagulate. Strawberrie: High in vitamin C, which increases iron absorption. If strawberries are eaten on their own, oily seeds such as sunflower seeds, walnuts, or almonds can be consumed together in a salad to increase its protein content. Spring Greens: Try to use generous amount of fresh herbs such as parsley, dill, knotweed, fresh mints, which herald the coming of spring, in your salads and with your meals. 100 g of parsley contains high amounts of folic acid, calcium, potassium and vitamin C. 100 g of fresh mint is a good source of zinc, which is good for healthy hair, skin, and nails. Broad Beans: Good source of fibers. Fiber helps to keep the digestive system working properly. Contains folic acid and potassium, which helps to balance blood pressure. It is richer in protein than many other vegetables (eggplant, zucchini, pepper, cauliflower and so on). Kidney Bean: Rich in potassium, zinc and folic acid. In terms of bio-availability of its mineral content, it is recommended to be eaten with foods that contain vitamin C (e.g. dark green vegetables). Carrots: Fiber source that helps with motility. Rich in vitamin A, which is good for eyes and vision. In order to have 5 portions of fruit and vegetables a day, do not forget to add carrots to your salads! Spring Potato: Good source of vitamin C. Good source of vitamin B6 (pyridoxine), which helps maintain a healthy nervous system functions. Should be kept in a cool, dry, and dark place. In germinated potatoes, the amount of poisonous “solanine” increases. Do not consume such potatoes. Spinach: Contains folic acid, which is especially important for pregnant women. Spinach contains calcium just like other dark green vegetables (leek, broccoli, parsley, rocket and so forth). Spinach can either be cooked or mixed with high protein food such as yoghurt sauces or tuna fish and goat cheese and consumed as a main dish. Lettuce: Rich in vitamin A, which is good for eyes and vision. Contains vitamin C, which protects and improves the immune system. Bell Peppers: High in vitamin C, which increases iron absorption. A source of fiber. Can also be used raw in salads. In addition to stuffing peppers with meat or cooking it with olive oil, you can create alternatives by stuffing it with feta cheese and herbs or grains such as wheat.